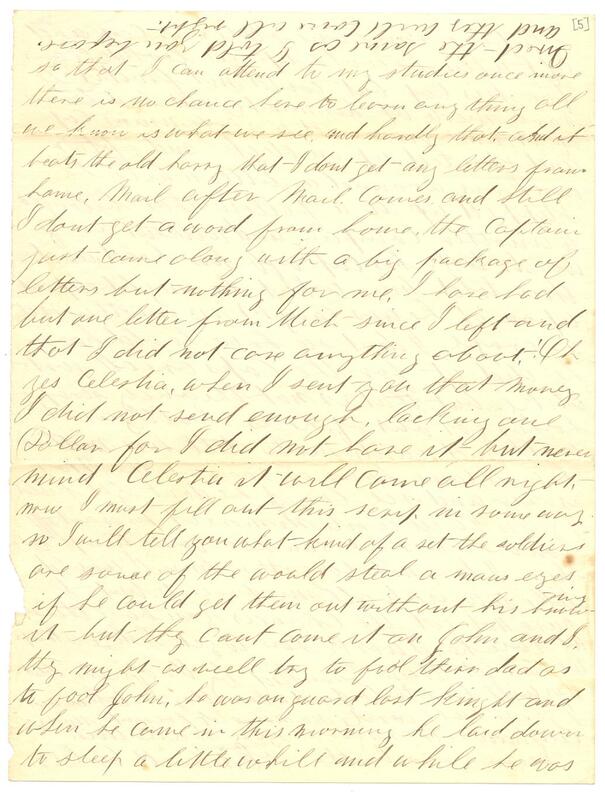 Item description: Letter, 26 October 1861, from Emmett Cole, Company F, 8th Michigan Infantry Regiment, to his sister Celestia. Written aboard the U.S. Steam Ship Vanderbilt, Cole describes his present conditions, at sea with the United States Navy fleet. 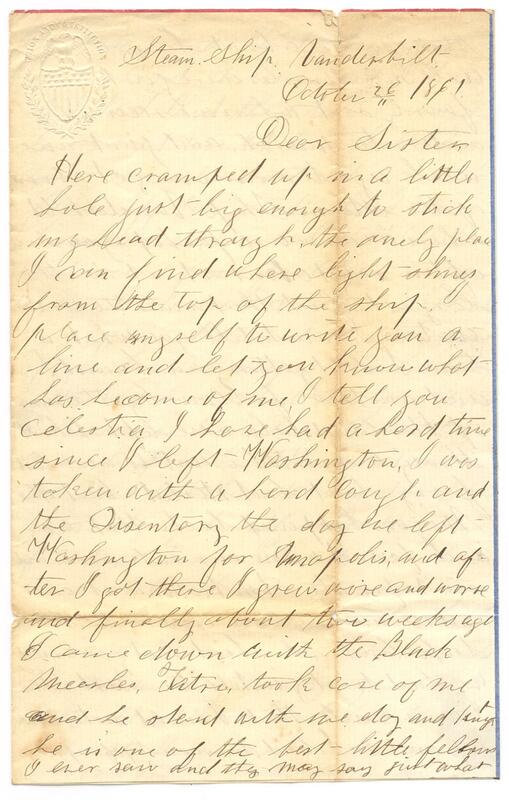 Emmett Cole of Barry County, Mich., was mustered into Company F, 8th Michigan Infantry Regiment in September 1861. In October 1861, his unit sailed for the Carolinas, eventually encamping on Hilton Head Island, S.C. He participated in several campaigns and was wounded and apparently captured. He appears to have died of his wounds in Charleston, S.C., around the end of June 1862. Here cramped up in a little hole just being enough to stick my head through the only place I can find where light shines from the top of the ship. place myself to write you a line and let you know what has become of me. I tell you Celestia I have had a hard time since I left Washington. 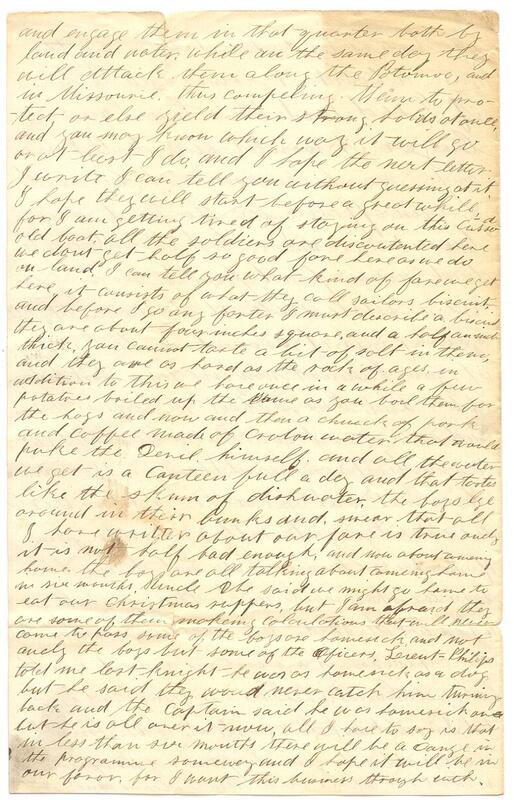 I was taken with a hard cough and the Disentery the day we left Washington for Annapolis, and after I got there I grew worse and worse and finally about two weeks ago I came down with the Black Measles, [Tatre? 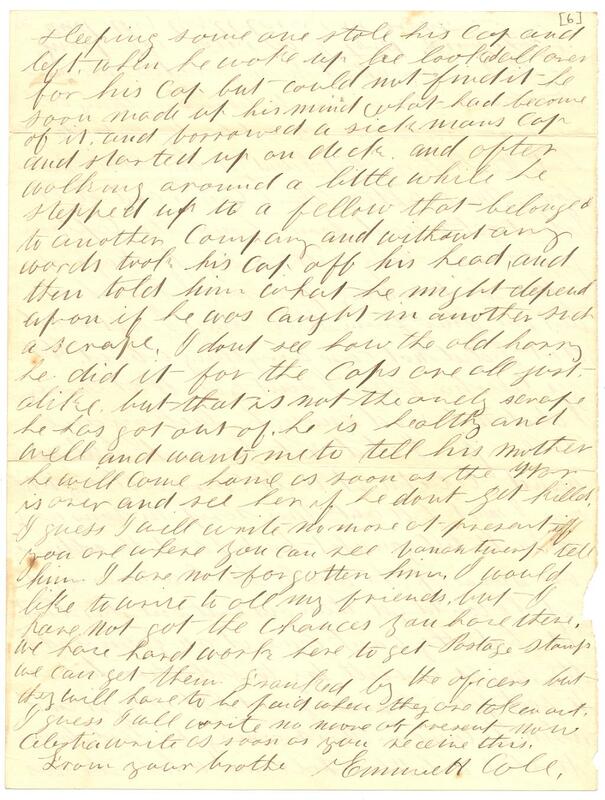 ], took care of me and he staid with me day and knight he is one of the best little fellows I ever saw and they may say just what they please about him & well my measles were just fairly out when we received orders to march and just a week an tomorrow we got aboard of the Steam Ship Vanderbilt where we now are. perhaps you have often read about it. it is the largest Boat that runs the western waters. I must tell you what a time I had getting on board and another fellow by the name of Harland Cole, were left behind through mistake untill our last ferry boat had started, but the Major happened back that way and found us in our sick room and sent for the Amublance at once and we were taken down to the dock but the boat had gone and we had to stay until the Boat returned I was so sick that I could not stand up so I laid down on top of a pile of boxes and laid there in the rain about 7 hours and I believe if I had laid there two hours longer it would have killed me but I am better now and begin to fee an appetitie for the hard sea biscuit and more, but Oh! Celestia dont never find fault when you are a little sick at home with all your friend around to take care of you. I must now give you a short history of the Fleet. there is about 70 Ships in the Fleet and as near as I can learn there is about 70,000 troops on board. there are 1,500 on this Boat but this is the largest in the Fleet we are lying directly under the guns of Fortress Monroe. I do not know how soon we shall sail nor where we shall go when we do sail, nor does any man on board. the expedition is a secret one and not even the Colonel knows where we are going, and if I did I would close with it. but this I will write the general opinion of the Oficers is that we shall go to New Orleans and engage them in that quarter both by land and water. while on the same day they will attack them along the Potomac, and in Missouri. thus compeling them to protect or else yield their strong holds at once and you may know which way it will go or at least I do and I hope the next letter I write I can tell you without guessing at it. I hope they will start before a great while, for I am getting tired of staying on this cussed old boat, all the soldiers are discontented here we dont get half so good fare here as we do on land. I can tell you what kind of fare we get here. it consists of what they call sailors biscuit and before i go any further I must describe a biscuit they are about four inches square and a half an inch thick, you cannot taste a bit of salt in them, and they are as hard as the rock of ages. in addition to this we have once in a while a few potatoes boiled up in the same as you boil them for the hogs and now and then a chunck of pork and coffee made of [croton?] water that would puke the Devil himself and all of the water we get is a canteen full a day and that tastes like the skum of dishwater. the boys lye around in their bunks and swear that all I have written about our fare is the only it is not half bad enough and now about comeing home the boys are all talking about comeing home in six months. 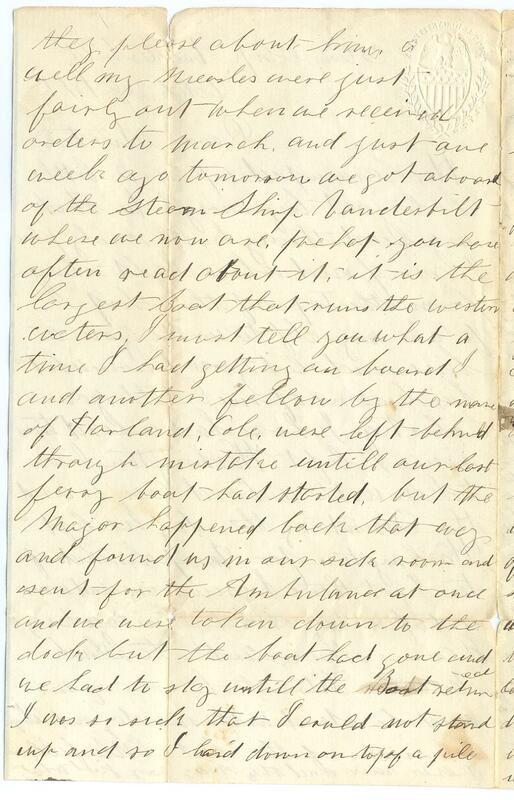 Uncle Abe said we might go home to eat our Christmas suppers, but I am afraid they are some of them makeing calculations that will never come to pass some of the boys are homesick, and not only the boys but some of the Oficers. Lieut Philips told me last knight he was as homesick as a dog but he said they would never catch him turning back and the captain said he was homesick once but he is all over it now, all I have to say is that in less than six months there will be a change in the programme some way and I hope it will be in our favor, for I want this business through with so that I can attend to my studies once more there is no chance here to learn anything all we know is what we see and hardly that. and it beats the old harry that I dont get any letters from home. Mail after Mail comes and still I dont get a word from home. the captain just came along with a big package for letters but nothing for me. I have had but one letter from Mich since I left and that I do not care anything about. Oh yes Celestia, when I sent you that money I did not send enough, lacking one Dollar for I did not have it but never mind Celestia it will come all right. now I must fill out this scrip in some way so I will steal a mans eyes if he could get them out without his knowing it but they cant comeit on John and I they might as well try to fool their dad as to fool John. he was on guard last knight and when he came in this morning he laid down to sleep a little while and while he was sleeping one stole his cap and left. when he woke up he looked all over for his cap but could not find it he soon made up in his mind what had become of it and borrowed a sick mans cap and started up on deck and after walking around a little while he stepped up to a fellow that belonged to another Company and without any words took his cap off his head and then told him what he might depend upon if he was caught in another such scrape. I dont see how the old harry he did if for the caps are all just alike. but that is not the only scrape he has got out of. he is healthy and well and wants me to tell his mother he will come home soon as the War is over and see her if he dont get killd. I guess I will write no more at present if you are where you can see [?] tell him I have not forgotten him. I would like to write to all my friends, but I have not got the chances you have there. we have hard work here to get Postage stamps we can get them franked by the officers but they will have to be paid when they are taken out. I guess I will wrote no more at present now Celestia write as soon as you receive this. 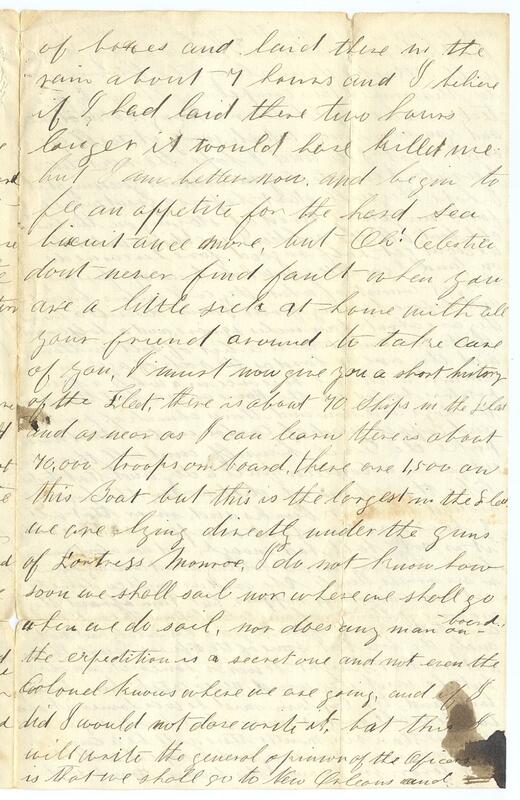 This entry was posted in Southern Historical Collection and tagged 8th Michigan Infantry Regiment, Emmett Cole, food, rations, sailors, steamers, U.S.S. Vanderbilt, United States Navy. Bookmark the permalink.